Scientists at York University in the UK and Montevideo in Uruguay have published some new ideas about Josephoartigasia, the extinct giant rodent that I reconstructed a few years ago. They asked if my painting could be used for the press announcement. The idea of these creatures using their teeth as powerful weapons has been very popular. I would love to imagine two male Josephoartigasia in a rutting contest, with David Attenborough narrating. 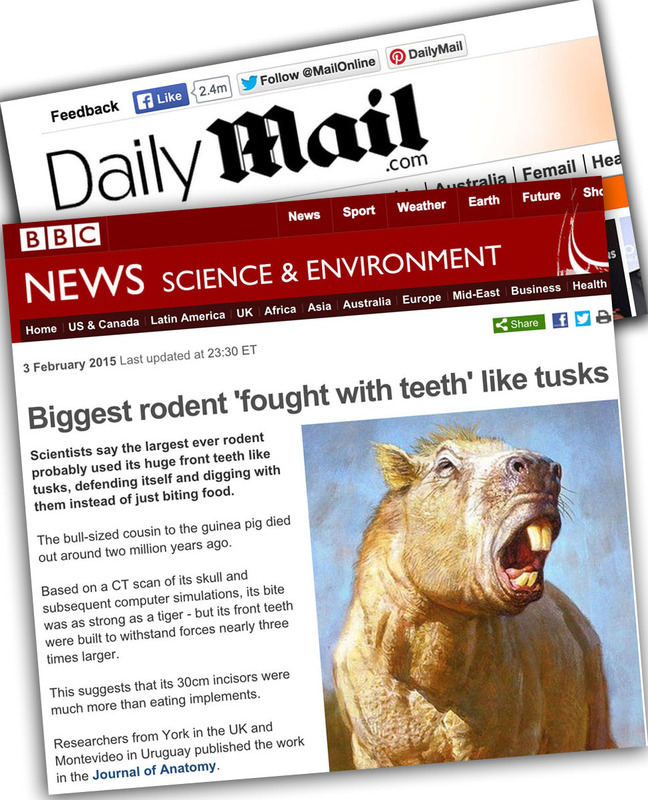 BBC: "Biggest rodent 'fought with teeth' like tusks"
Daily Mail: "Enormous 3-million-year-old rodent used its teeth like elephant TUSKS: Ancient mammal used incisors as tool to dig and defend itself"
I talk about this picture's use of depth of field in my book Color and Light: A Guide for the Realist Painter . Extraordinary beast, one I imagine comfortably hosting an orc rider. Wonderful work too James.